Remarkable that we haven’t blown the planet to bits with an atomic bomb. Not yet, anyway. An atmospheric nuclear test ban went in effect August 5, 1963. Exactly 51 years ago today. And almost 20 years after Hiroshima and Nagasaki were obliterated. The 1963 Limited Nuclear Test Ban Treaty – signed by America, Britain, and Russia – limited nuclear testing to underground blasts. Atmospheric, outer space, and underwater tests were prohibited to put “an end to the contamination of man’s environment by radioactive substances.” Good idea. But further nuclear bomb treaties were made possible because of an unlikely discovery made by a geophysics grad student. A seismic shift towards world peace began when seismologist Jack Oliver, working at the Lamont Earth Observatory just outside New York City noticed some peculiar wiggles showing up on his seismometer. Several things seemed immediately odd about the wiggly shapes on his strips of paper. The seismic activity arriving in New York appeared to be coming from the deserts of Nevada, a place where strong earthquakes are rare. The second peculiarity was that the seismic wave form, the wiggle’s shape, was quite different from recordings of normal earthquakes. A seismogram from an earthquake starts with strong sideways shear waves, accompanied by weaker pressure waves. Pressure waves are as you might expect – forward pressure along the ground, while shear waves result from side-to-side shaking. During an earthquake, rocks break along a fracture zone, shearing raggedly. That’s why the arriving shear wave is strong and shows side-to-side motion. But Oliver’s records began with a sudden sharp forward-moving pressure wave instead. The third strange thing about the seismic record was that the signal seemed to radiate from a single point, not a fault zone. Jack Oliver deduced that the single-point was a nuclear explosion in the Nevada desert. Oliver was inadvertently spying on a top-secret test of American atomic weaponry, 4,000 kilometres away. Jack Oliver admitted he was a bit nervous when he realized what he had discovered. He had the practical common sense of a midwesterner and suspected the army might not be pleased when they learned that a civilian was looking over its shoulder. Oliver was born into a small heartland community, Massillon, Ohio, a steel town just west of the tire factories of Canton. He had been a talented football player, a member of a high school team coached by Paul Brown, later the first coach with a professional football team named after him – the Cleveland Browns. Paul Brown’s help and Jack Oliver’s talent earned him a sports scholarship. But university was interrupted in his second year by World War Two, which put Oliver in the South Pacific. He was thirty years old when he finally finished his geophysics doctorate at Columbia, and accidentally uncovered a way to monitor secret atomic weapons tests. Rather than being arrested for eavesdropping on the military, Jack Oliver was soon fêted as a celebrity scientist – the world’s expert on detecting nuclear explosions. He showed that seismic waves from an atomic bomb could be recorded by any backyard tinkerer, anywhere on the planet. 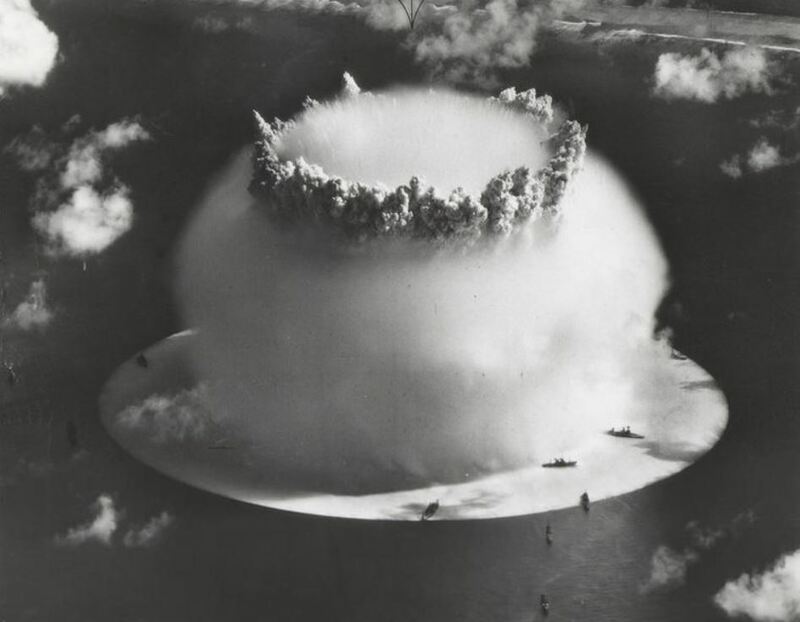 Secretive nuclear tests could no longer be hidden from scrutiny. Oliver was invited to the White House. Eisenhower asked him to advise on the first draft of the Nuclear Test Ban Treaty. In the late 1950s, Jack Oliver was a delegate to negotiations in Geneva. With his discovery, American scientists could monitor Russian activities (and, of course, vice-versa) making nuclear tests verifiable and a non-proliferation treaty possible. Geophysicists triangulated blast locations and estimated weaponry power. There’s more to the story – the American government asked scientists to install monitors all over the world. Their new data proved Tuzo Wilson’s theory of transform faults and gave Jack Oliver and his team proof that subduction plates disappear into the Earth’s crust. . . This tale continues in the book, The Mountain Mystery. This entry was posted in Biography, History, How Geophysics Works and tagged earthquakes, geophysics, history, Jack Oliver, seismic recording. Bookmark the permalink.